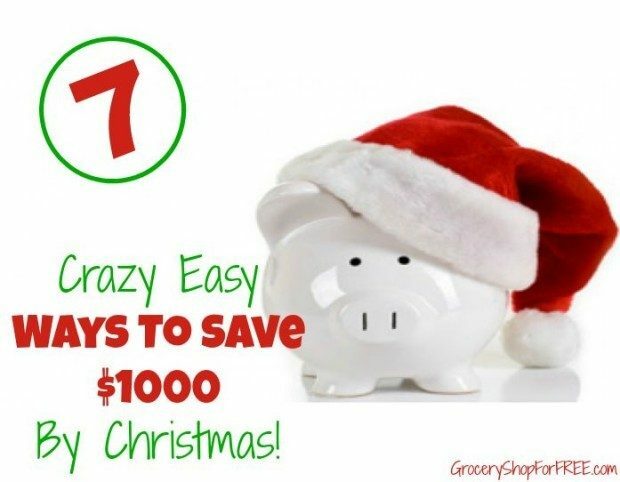 You are here: Home / Family Living / 7 Crazy Easy Ways To Save $1000 By Christmas! These crazy easy ways to save $1000 by Christmas will help make your gift shopping so much easier. Everyone panics over how to provide their friends and family with great gifts while staying in budget. These tips are a bit outside the box, but great ways to accumulate at least $1000 between now and Christmas to help pay for every gift you want to give. Have a yard sale. We all have extra junk laying around. As summer months wind down and cooler temperatures approach it is a perfect time to grab those bins of clothes the kids have outgrown, random decorations and any junk that is in good shape to sell and have your very own yard sale. You can cut down on clutter and make a few hundred dollars in one easy morning. Change your insurance policies. If you haven’t updated your insurance policies it is time to call and compare prices. Start with vehicle insurance, but don’t forget to check into your home owners, renters or even health and life insurance. There are almost always better rates available, as well as things you may be able to drop from policies that are just no longer necessary. Start a side business. Start a side business doing something you love, or selling something you have created. Everything from fun craft items like wreaths for decorating or handmade scarves and gloves are all easy to make and great ways to make money. Sell cosmetics through a direct sales company, or take on a job pet sitting for your neighbors. Every little bit helps and can easily go toward your $1000 Christmas gift budget. Cancel your cable or satellite service. This can be a huge waste of $100 or more every month. Invest in a low cost streaming service through Hulu, Netflix or even Amazon Prime and pay $10-$25 a month instead of $50-$100. You’ll still have access to your favorite shows, but you won’t be paying near as much out of pocket. Cook everything from scratch. Buying processed and canned foods can often cost much more than simply making foods from scratch. Take the time to put into cooking meals from scratch for your family. A solid menu plan and utilizing things like freezer meals and Crock Pot cooking can save tons of money in your grocery budget that is a super easy way to save $1000 by Christmas. Stop eating out. Even one meal a week out for a family of 4 can be around $40 for just entrées and no drinks. Multiply that by 4-5 weeks in a month and you have up to $200 a month in savings just when you stop eating out. Take public transit. If you live near a public transit system, take advantage of this and park your car for a few months. Public transit passes can easily be up to half the cost of what you would be putting into you car in gas and maintenance. Even if just for a few months, this can increase savings on transportation and add to your Christmas budget fast. 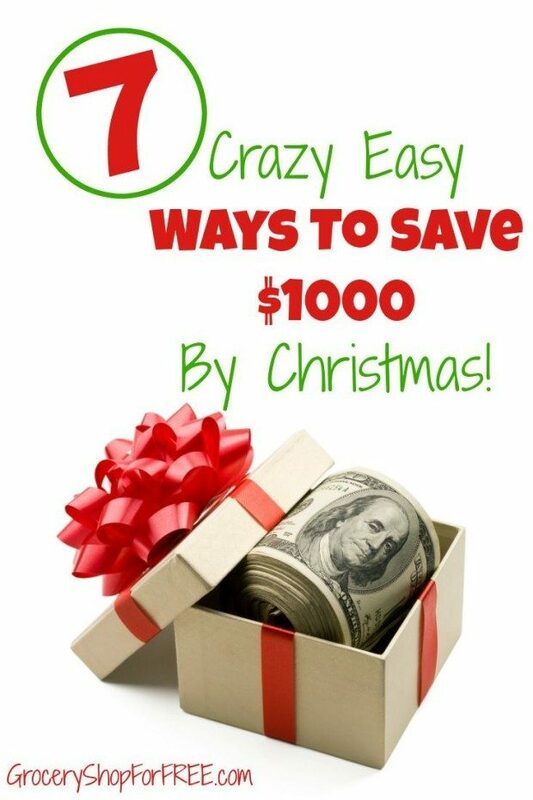 These crazy easy ways to save $1000 by Christmas are just small things you can change in your daily life without frustration. A little bit of effort on your part can make this Christmas an amazing time of giving. I would like to add a few more ways to save money, quickly. 1. Save your change. If something cost $1.01, give them $2.00 and then put all change in a coffee can in your room. Easily adds up to $20+ a month for me. 2. When you come out of a store, look at your receipt, and whatever it says you saved (I.e. $14.96, etc) save it. Immediately call your bank and transfer the amount saved to your savings account. Adds up quickly! 3. Have your payckeck direct deposited and have 10% transferred into your savings account.